Burbank Sign Company | Are looking for competitive sign pricing? Why do business with The Sign Studio? In addition to delivering quality signs at a competitive price, the reasons are many. First, our experienced teams do the job right -- that goes for design, fabrication, and installation. Our crews are flexible enough to get things done on-time and under your scheduling guidelines. Also every job, every project, and every installation is fully managed so you know exactly what to expect -- before the sign goes up. We do everything.Our staff of experienced metal fabricators and neon workers create all of our channel letters and sign cans. Our in-house technology infrastructure and sophisticated design environment makes us one of the most technologically advanced sign companies in the area. Our installation crews are experienced enough to handle the most demanding environments. We Understand Your Needs.Your signage is a direct reflection of who you are as a company. Exactly why we work hard to find the perfect medium that best captures the feeling and brand promise that you need to communicate. And because we've been doing this a long time, we know what types of materials, sizing, and presentation will work and what won't. From initial consultation to final installation, The Sign Studio Inc. provides an attention to detail that our competitors can't match. For a free estimate, simply call (818) 843-9200 or stop by the shop and see some samples for yourself. Our prices are competitive and accurate and our customer service is the best from concept to finish. Our team of engineers will ensure that the best structural design is implemented. This includes design and specification for all sign components, including face decoration, lighting, structure, metal fabrication and painting. We will offer help with manufacturing suggestions, valued engineering and installation methods. We will find a solution for any technical issue. Our company is aware of local municipal codes and city ordinances and will not fabricate or install any project until all the necessary permits have been issued. The Sign Studio Inc. will prepare and manage all paperwork involved in the permitting process. All costs associated with the permits (i.e. man-hours, city fees, etc.) will be added in the estimate upon request. After a thorough examination of the property and surroundings we can determine where signs are needed at the site for identification and directional purposes. We will take accurate measurements, photos, determine if there is electrical access and local code information. Our goal is to find the most visibility & access of your sign to increase the volume of traffic that passes your location every 24 hours. At The Sign Studio Inc. we understand that a creative and marketable sign is necessary to attract the targeted audience. Our company's award winning design team incorporates all logos and related material into the sign it builds for the prospective client. They work close together with our engineers and production managers to assure a satisfactory and effective sign design. If you have any questions, please call The Sign Studio at (818) 843-9200 or send us an e-mail at thesignstudio@sbcglobal.net. Burbank Sign Company | How Important Is Sign Visibility? Have you ever wondered what the readable distance for maximum impact is? Have you ever wondered what the maximum readable distance is? Is the maximum impact of reading time important to you (length of time letters are readable when moving?) Have you looked over or discussed color combinations that have proven the most effective and the easiest to read? Remember, a good color selection can dramatically increase readability, especially when at a distance. 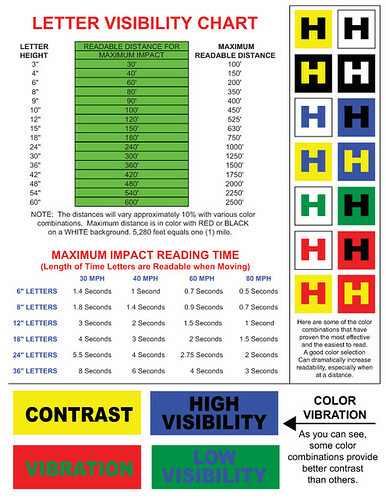 Before you make any decisions, please review our "Letter Visibility Chart" and if you are confused or have any questions, please give us a call at The Sign Studio (818) 843-9200. 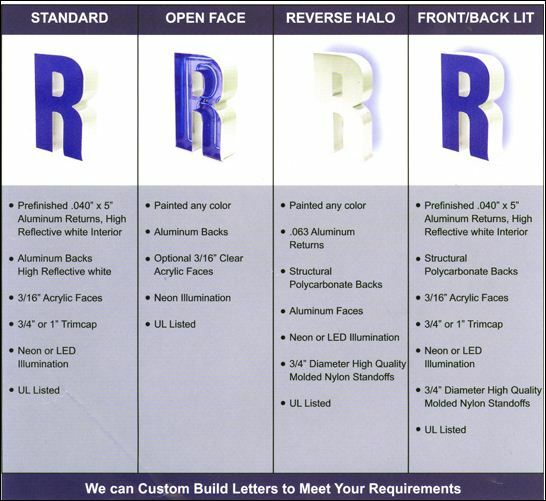 Burbank Sign Company | Should You Retrofit Your Channel Letters? What style channel letter are you looking for? Here are some examples of the most common channel letters for your information. If you have any questions or need any further information, please give us a call at (818) 843-9200 or email us at info@signstudiola.com. Burbank Sign Company | Are You Looking For A Custom Sign? ustom Signs - We do it all! Business, Church and School Signage of all kinds! 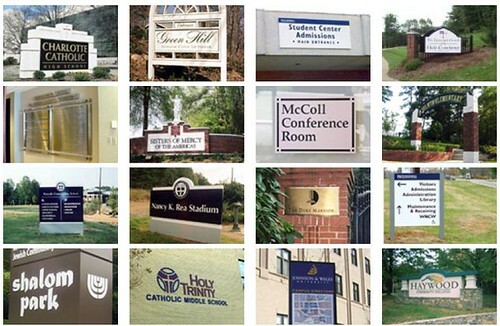 Over many years, The Sign Studio has provided signage systems for many public, private and parochial schools, as well as conference centers and corporate training facilities. Campus (or multi-campus) signage for all levels of facilities - elementary, middle, high school; community, junior, and four-year colleges - must facilitate the flow of pedestrian and vehicular traffic, both inside buildings and on the grounds. Buildings and rooms must be identified, often by their generic (functional) name as well as their proper name. With our vast experience in this type environment, The Sign Studio can assist in the design, wayfinding, and implementation of campus-wide systems. Solutions must recognize the need for durability, flexibility, consistency, and economy of scale, while also sending an underlying message of institutional identity compatible with the organization's values. Drawing from a wide selection of signage materials and manufacturing methods, The Sign Studio can help plan and design solutions to meet practically any budget. If you have any questions or need help with your Business or School Signage, please give us a call at The Sign Studio (818) 843-9200 or send us an e-mail at info@signstudiola.com. Is the World of Vehicle Wraps complicated? Is this something you want to get into or would you rather hire an experienced professional Sign Company to do your vehicle advertising for you? • Full and partial vehicle wraps have become a cost-effective means of advertising. Vehicle wraps can be a creative business endeavor with a Vehicle Wraps Summary. • Vehicle wraps can be a creative business endeavor with a reasonable potential for profit. • Establishing a wraps business requires investments in equipment, supplies, shop space, education and time. • Wraps production process involves design, print and installation. • The learning curve is significantly less with a background in graphic arts, web design, wide-format printing or advertising. • Specific wraps training is available at various locations and industry trade shows, as well as from equipment and vinyl manufacturers and experienced professionals. Training involves design and layout, basic procedures and various methods and approaches of the installation process, followed by practice and individual experimentation. • Laminator should be at least the same size as the printer to completely laminate the vinyl. • Evaluate consistency, quality, durability, performance, cost, compatibility and removability. • Check reports and reviews about issues with bubbling, printing and cracking. • Experiment with matte or reflective vinyl. • Costs of equipment and materials as well as rent, labor, taxes and insurance expenses must be factored into the overall pricing method. • Other pricing factors: square footage of material; design and production time; installation time; customer’s budget. • Price wraps to be competitive, yet profitable. • Key is to run the operation efficiently. • The design setup is a separate charge. • Print setup may be a separate charge. • Installation may be a separate charge. • Pricing software helps automate estimating, but it’s important to account for vehicle square footage, material type and other variables. • What is the wrap going to advertise? • Work within a realistic customer budget. • Consider partial wrap alternatives for smaller budgets. • Inform customer about the expected life of the media and your company's policies about the wrap media warranty. • Determine installation requirements. Consider extreme curves, rivets, door handles and other protruding parts that impact the amount of materials involved in printing and installation time. • Design around extreme areas to save time on installation. • Secure signed approval and deposit before printing and installation. • Quality of printing and lamination is critical. • Install without noticeable seams, bubbles or other imperfections. • Many available wrap media products can be repositioned for best visual alignment and to help remove bubbles during installation. • An attractive wrap is also an advertisement for your business. Burbank Sign Company | Do You Want To Install Your Banner? Want to save money and install your own banner? If so, here are some typical banner installation methods. Banners are generally installed using one of these four methods. ARCHITECTURAL SIGNAGE- Does more than communicates a message. 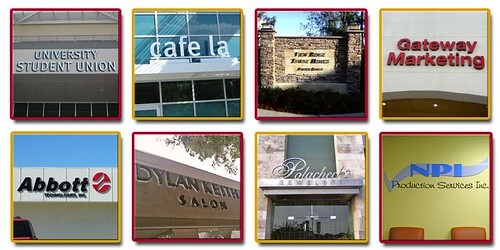 Architectural signage must also help build the brand name of the company it serves. Success depends not only on precision craftsmanship but also on cutting edge design and carefully selected materials that will best represent the finished product. Creating quality architectural signage means understanding the details and planning for the obstacles involved. The challenges are somewhat different depending on whether you are creating signage for indoor or outdoor use.The challenge on indoor signage is to have a degree of precision that is unsurpassed. With exterior signage the tolerances do not have to be quite as precise, but there are other challenges that are just as significant, such as weather conditions and environment. Interior signs are in air conditioned environments but with exterior items we have to worry about sunlight, humidity, heat, cold and so on. Fade resistant materials are important to protect both indoor and outdoor architectural signage from the sun and understanding the impact of ambient lighting is also a key challenge. Between durability and lighting concerns, choosing the right materials for architectural signage can be a major obstacle for the novice. Avoid lower end plastic products, they look cheap. The actual "look" of a sign is the focus of most everyone's attention. The primary challenges in the design phase is coming up with a look that the everyone wants and choosing materials while staying within budgets. It is important to choose materials in the design phase so that you can prepare for any special requirements, such as lighting, mounting, or curved walls. For further Information or if you have any questions, please call The Sign Studio @ (818) 843-9200 or send an e-mail to thesignstudio@sbcglobal.net. Red: Red is exciting and active - it suggests boldness and efficiency, and is appetite-inspiring, hence McDonald's use of red (as well as yellows and oranges). As you can see, red especially appeals to "Emulators," or people who are sales-oriented and talkative. Red implies urgency. Blue: Blue is the most widely used color in appealing to businesspeople and entrepreneurs called "Achievers." Blue is serene, suggesting wisdom, dignity, and stability, hence the wide use of blue by banks. Men prefer blue to red and are supposed to prefer blue to red because it is more restful to the eye. Blue is businesslike. Green: Green and other earth-tone colors appeal to the vast group called "Belongers." These people are the "middle America" people - usually employees, family people, and definitely relationship-oriented. They enjoy green, browns and golds. Earth-tones are friendly. Floor graphic advertising is a unique way to put your message in front of and under current and potential customers. If you advertise in a supermarket, convenience store, exhibit hall or airport, you're constantly battling other posters and signage for awareness. Why not try something unique, something that will make you stand out from your competition? With point of purchase floor graphics from The Sign Studio, you'll have a unique tool to capture your customers' interest and encourage a call to action. Customers tend to look down as they push shopping carts or wait in line to purchase their selections and a floor graphic, or decal or cling, is an easy, cost-effective way to grab their attention. It's especially valuable in driving last minute or impulse purchases. In fact, floor graphics can increase these purchases by 10%! The Sign Studio has been producing and printing custom floor graphics for years. 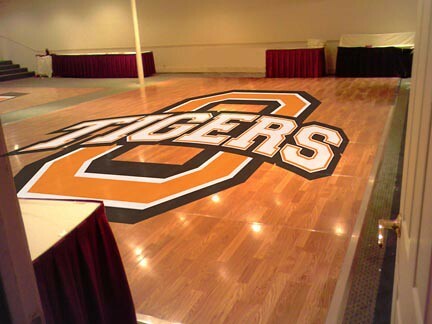 We understand the industry tricks, including bold graphics, strong messaging and die-cuts, to get your floor graphic noticed. Plus, we have the printing capabilities that make your graphics durable and long-lasting, so you can reach your most important customers day after day. Burbank Sign Company | What Successful Signs Can Do For You! Signs and graphics serve three general purposes: to inform, direct and sell. The initial impression a person has about a business is often the result of their signs and graphics. By employing effective signs and graphics, businesses of all types and sizes can make the most of that first impression. Signs are valuable to businesses of all sizes, and in all industries. Signs help consumers become aware of a business, service or event, can help prompt purchases, change purchase decisions and build brand equity. Signage is an inexpensive, yet very effective form of advertising. During a slow economy, advertising is crucial and it helps create a long-term competitive advantage. Maintaining an advertising presence through signs helps build long-term brand awareness. Effective signage can also be a determining factor in influencing customers to switch from a weaker brand. 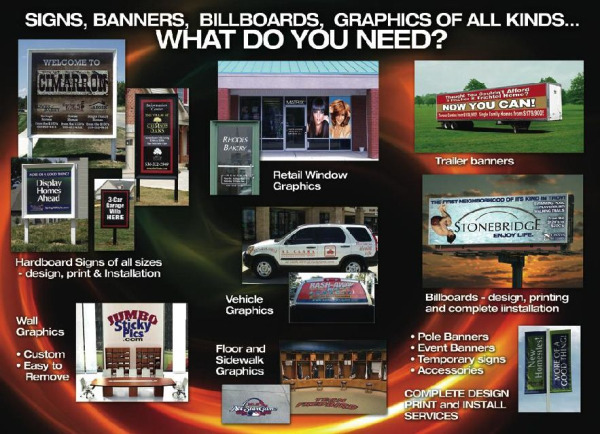 What can effective signs and graphics do for you? Contact The Sign Studio @ (818)843-9200 or send us an e-mail - info@signstudiola.com. Your Sign Studio consultant knows all the tricks of the trade show. We'll help you: Create a striking design that communicates a clear message and business image. Distill your product information into easy-to-read, bullet-pointed copy. Choose the right color scheme that complements your logo and shows off your products. Select a booth and graphic materials that are durable and lightweight for easy, affordable transport and storage Strategically position graphics to guide traffic flow in and out of your booth space. Keep your trade show booth on budget while also achieving a highly effective, professional look. The Sign Studio has everything you need to create a powerful trade show exhibition. Go to our Electronic Catalog -Exhibitors Handbook for ideas and suggestions. Contact The Sign Studio at (818) 843-9200 or send us an e-mail at info@signstudiola.com for assistance. Acrylic: Translucent plastic used as a channel letter face material. Acrylic is available in a wide of colors, and its thickness is typically 1/8" or 3/16". Channel Back: Aluminum that is routed in the shape of a letter to form its backing. Cut-off switch: Electrical switch placed on the outside of the building, usually above, below or on a channel letter signs raceway. Drain holes: Small holes placed at the bottom of a channel letter. Drain holes permit rain and condensation to drain out of a letter's interior. Electrode: The terminal at the end of a neon tube that connects to a GTO wire. Neon tube fabricators attach electrodes to glass tubes by melting the glass to form an airtight weld. GTO cable: Insulated electrical wire designed for high-voltage current. GTO cables connect neon tubes. Electrode boot: A rubber boot designed to be installed on the double back or electrode of a neon tube to protect against electrical shocks or arcing. LED: An electronic light source for channel letters. LED stands for Light Emitting Diode, and this type of lighting is illuminated by the movement of electrons in a semiconductor material. 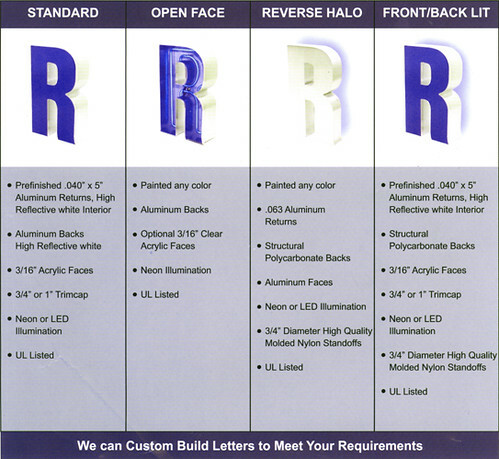 LED Channel letters are becoming more and more popular. Neon: Another illumination option for channel letters, neon is a luminous glass tube filled with inert gas. High voltage electricity from a transformer excites the gas to produce light. Tubes may be bent to form various shapes and letters. Permit: A legal document required by a municipal building department that allows the installation of a specific sign at a designated location. It is illegal to erect a new sign without first obtaining the appropriate permit. Polycarbonate back: A protective plastic insert cut to the same shape as a reverse channel letter and attached to seal the letter's back. This prevents rainwater entry and also keeps animals from nesting inside the letter. Polycarbonate backs also provide mounting surfaces for neon tube supports. Raceway: An enclosed aluminum channel (typically 8" by 8") that spans the entire length of the letters. Channel letters are pre-installed on the raceway in the shop, thus simplifying installation in the field. Return: The side of a channel letter. Returns are commonly constructed of aluminum, and are typically 5" deep. Tie wire: Thin copper wire that attaches a neon tube to a tube support. Transformer: A channel letter's high-voltage power supply. Transformers are available in various current outputs, typically ranging from 7500V to 15,000V. Trim cap: The flexible plastic edging that surrounds a channel letter's face. 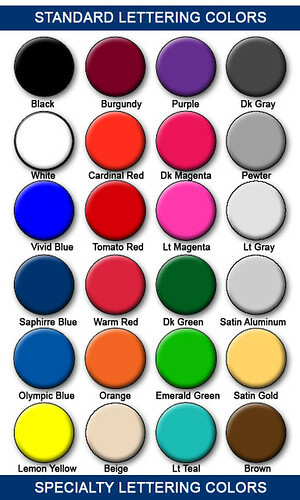 Trim caps are chemically welded to the face, and are available in a variety of colors. Tube support: A glass standoff that typically is fastened to a channel letter back to hold neon tubing in place. UL-approved: Underwriter's Laboratories (UL) is an independent product safety certification organization. 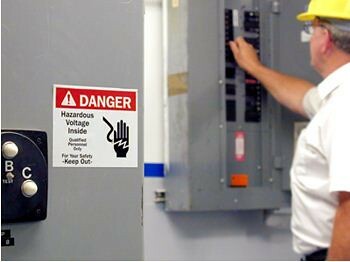 UL approval means that all sign components meet UL standards for electrical safety. READY TO APPLY LETTERING - also known as RTA Lettering. If you are looking to save yourself some money and are confident in your application abilities, the following directions on how to apply your own vinyl lettering will help you to install your own signage. 1. Apply window cleaner, soapy water, or denatured alcohol to clean the surface where the lettering will be placed. Use a lint-free cloth to wipe the surface dry. 2. Use a water-soluble pencil to draw guidelines and centerlines to help align the lettering. 3. Fill a spray bottle with a mixture of water and 3 drops of liquid dish detergent. 4. Before applying, rest the lettering on a flat surface and carefully squeegee across the transfer tape that covers the bottom. 5. Find the center of the lettering and make a small mark at that point on the transfer tape. 6. With the lettering face down, peel the backing paper away from the lettering, which will remain adhered to the transfer tape. 7. Lightly spray the exposed sticky side of the lettering with the soapy water solution (if the letters are being applied to glass and are smaller than 1" in height, do not use the spray, it could cause misalignment.) Small letters should be applied dry. 8. Place the lettering and transfer tape onto the surface, using any guidelines and centerlines you have made to help align the lettering. 9. Squeegee the lettering from the center outward toward the edges, overlapping your strokes to prevent air and water from being trapped under the lettering. 10. Leave the application tape attached to the lettering and let it dry for about one hour. 11. 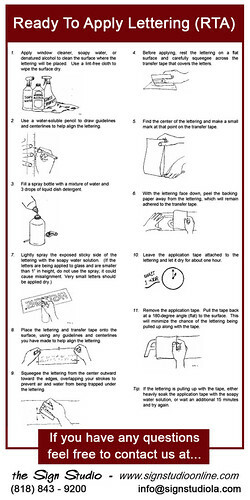 Remove the application tape. Put the tape back at a 180-degree angle (flat) to the surface. This will minimize the chance of the lettering being pulled up along with the tape. If you have any questions of need help with your Installation, please give us a call at (818) 843-9200 or e-mail us at thesignstudio@sbcglobal.net. Burbank Sign Company | Sign Letters - Distance and Size? store environment need only be an inch or two tall, while an overhead exterior banner being read from a nearby street or highway would need much larger letters in order to be seen from a distance. Also, font selection will play an important role as some fonts are thin and script like, while bolder fonts and capitalization (with appropriate spacing) can improve readability. Trying to skimp or economize by using a smaller lettering size is definitely not a wise decision. 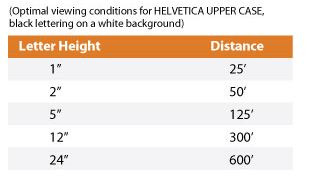 See The Sign Studio’s Legibility/Readability chart below for an example assuming Helvetica upper case black lettering on a white background. Burbank Sign Co. | Vehicle Magnetic Signs - How to care for and install. THE SIGN STUDIOuses the finest magnetic material to bring you the best in mobile magnetic advertising. Correct preparation, installation, maintenance, and storage procedures should be followed, see (Sections 1 - 4.) Following these instructions will help to ensure your satisfaction and to safeguard the long life of your signs and vehicle. Due to the many variables and complex nature of automotive finishes, special care must be taken to protect your vehicle: check the area behind the magnetic material weekly and move the sign as necessary to prevent any discoloration or clouding of the automotive clear coat. 1. PREPARATION: Wash and dry vehicle. To protect your signs and vehicle, wax vehicle surface and the brown magnetic side of the sign prior to applying. *** Note: A magnetic sign should never be applied to a newly painted vehicle. Allow at least 60 days for fresh paint to cure. 3. REMOVAL & MAINTENANCE: Remove the signs from your vehicle weekly. Always remove the sign by lifting from the center of the two opposite sides-never start at the corners, as this may stretch the sign material. In cold weather, preheat the sign with warm water before removal, if necessary. Once the signs are removed, wash and dry the vehicle and all sign surfaces. This keeps moisture from collecting between the signs and the vehicle surface, which can potentially damage a vehicle's finish. To clean the signs, use a sponge and a mild soapy water solution. Never immerse the signs in water, steam clean, or take them through a car wash. A generous coat of wax on the surface where the sign is placed and on the back of the sign itself will help prevent damage. After rain or snowfall, remove signs and wipe dry. 4. STORAGE: Magnetic signs should be stored either on a flat, even surface, or rolled up (lettering to the outside) around a cylinder with a diameter of at least 3". 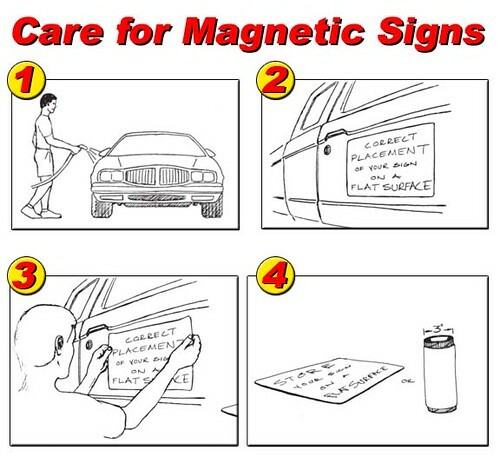 Never store magnetic signs in a hot vehicle, as they may permanently warp. Do not damage signs by folding, creasing , or placing any heavy objects on top of them. This type of treatment will prevent the signs from retaining their full magnetic power. If a sign does get bent out of shape, you can try to straighten it by placing it on a flat metal surface, such as a file cabinet or refrigerator. If you cannot straighten the sign, it will need to be replaced. WARNING: Automotive finishes and protectants vary by manufacturer; changes in color, shade, and surface appearance can occur with time, daily usage, and exposure to direct, intense sunlight. For care of your automotive finish, please refer to your vehicles Owner's Manual. Please give us a call at (818) 843-9200 or send us an e-mail at thesignstudio@sbcglobal.net if you have any further questions. Unless specifically waived, all applicants for Development Review (DR) are required to post a sign on the project site providing public notice of the pending development application. This is in addition to the mailing of notices to nearby property owners and tenants. 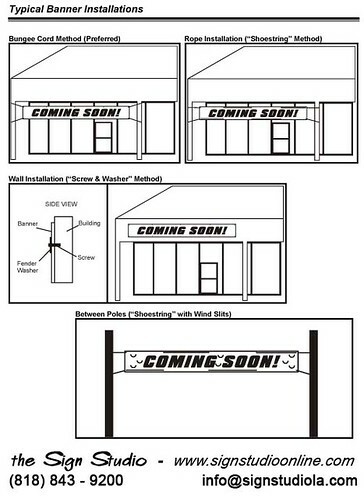 Requirements for the design, construction and placement of the sign are as detailed below. 1. The sign is to be erected on the project site at least 10 days prior to the Director’s Decision dated. The sign is to be removed after the Development Review appeal period has ended. If the determination is appealed, the sign is to be removed after the appeal has been decided. d. The sign must be constructed of plywood or a similar sturdy material. Paper or cardboard is not acceptable. The sign must be supported by two posts with a minimum size of 4 inches by 4 inches, with proper footing if required. e. The background of the sign must be white with a border 1 to 4 inches thick. The border must be black or another dark color that contrasts with the background. f. Lettering must use a font that is readily legible and as large as possible given the amount of text necessary to fit on the sign. The lettering must be black or another dark color that contrasts with the background. g. Sign format is subject to approval b the City Planner. 3. Sign Copy: as shown below and in graphic. Please see our sample below and if you have any questions or need The Sign Studio to prepare your design/layout and post & panel sign for you, please give us a call at (818) 843-9200 or send us an e-mail at thesignstudio@sbcglobal.net. Burbank Sign Company | Warning & Safety Signs Need To Be Effective! Why Do Safety Signs Matter? 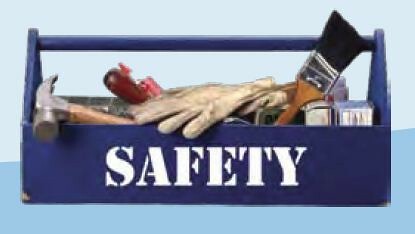 Safety signs, tags and warning labels are an essential feature to any plant or business, and comprise one of its most important assets. By not using proper effective safety and warning signs, you run a risk of danger that isn't worth the risk. To make your signs and labels as effective as possible, follow these hints. 1. Choose the Proper Header - The header helps get the sign noticed. 2. Choose the Right Material - Installation and ordering costs are often more than the sign itself. As a result, a durable sign always pays for itself with reduced labor. 3. Use Bilingual Warnings - Although the use of a symbol is strongly encouraged in order to better communicate hazard information across language barriers, more and more warnings themselves are now shown in two languages. 4. Learn about the New ANSI Standard - The new ANSI standard for safety signs emphasizes custom design. It suggests that you add an Action statement, consequences, a symbol, use mixed case and, in many situations, add emergency information. Burbank Sign Co.| Vinyl Logo Graphics and Lettering Are Resourceful! THE SIGN STUDIO is an Expert on vinyl wall lettering and vinyl wall graphic products. Our solutions are employed in retail businesses and in the private sector. Vinyl wall lettering can open a customer's eyes using largely untapped areas of a showroom. Why not wrap vinyl wall lettering throughout a demo area, waiting room, treatment center, conference room, you name it, THE SIGN STUDIO has done it! Our wall lettering and wall graphic solutions deliver! We can help design and implement a theme throughout an interior space with our advanced software and signmaking equipment. Sell more, promote more, and inform more by using THE SIGN STUDIO'S vinyl wall lettering. We are capable of decorating large and small areas, using materials that can be removal-resistant or purposely removable. Have you seen the professional sports stars that stick to a wall and are removable and reusable? We make those for your young soccer star, little league ace or football prodigy! Many displays at historic places and museums have been created by THE SIGN STUDIO to educate visitors and enthusiasts. If you can conceive it, we can make it happen with our vinyl wall graphics. We have so many colors and designs you can incorporate into your vinyl wall graphics, or let us use your established symbols, logos and designs. THE SIGN STUDIO is the best place to purchase vinyl wall graphics and lettering, we have the experience to give your walls a makeover. 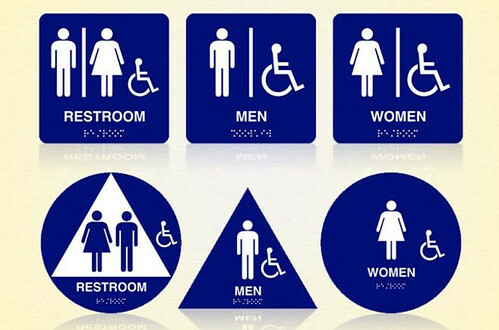 Many businesses don't realize there is a far-reaching and organized series of laws and procedures that govern bathroom signs and handicapped signage. The ADA, the Americans with Disabilities Act, was enacted to give due diligence to making sure that all public spaces, including restrooms and places where industrial signage is needed, are accessible and familiar to the handicapped person. Recently, the laws regulating ADA restroom signs, and all ADA signs in general, have changed. New legislation has brought all the old ADA signage up to modern codes, and compliance is a must. 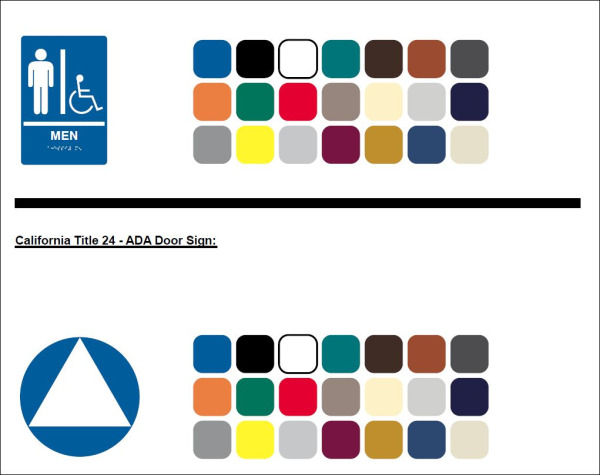 ADA signage refers to a lot of different laws and regulations, but some of the ADA restroom signs in particular that have been significantly affected by the new rules are braille signs. Braille signs are one of the most important aspects of restroom signage that ADA regulates, and with good reason. There are dozens of possible pitfalls when it comes to creating a braille sign, not least among them positioning, changes in braille itself, height, and prescribed size and lettering. For a handicapped person, it's absolutely essential that your bathroom signs speak to them in a way that they understand and are familiar with. These new laws make it that much easier to create informative, helpful, safe ADA restroom signs, and to create a braille sign that speaks to the widest possible audience as clearly as it can. ADA signage is something that's easy to overlook in the rush to get through a job, or to design your interior space in a way that's pleasing to the eye and works with your business, school, hotel, or place of business. However, few things are more important about your ADA restroom sign than the way it speaks to the disabled. The right braille sign, the right ADA sign of any stripe, is designed to keep your business in good standing in two ways. One way is compliance. Without it, your space could be subject to penalties and even lawsuits, and that's never a good thing. The other way is simple customer/occupant care and service. Without the right kind of ADA signage, your handicapped patrons will have a harder time doing what they need to do in your space. Both of those simple, very compelling reasons for updating your signs are focused on here at The Sign Studio. .
Below you'll find a run down of many of the new ADA sign regulations that relate to industrial signage and braille signs. As a service to you and a guideline for how we make our signs in the future, we're placing these ADA regulations on our site - check back to reference them whenever you need. The Sign Studio is your one-stop shop for any kind of braille sign, ADA signage, or any type of state and federal law-compliant sign. "Letters and numerals shall be raised 1/32 in (0.8 mm) minimum, upper case, sans serif or simple serif type and shall be accompanied with Grade 2 Braille. Raised characters shall be at least 5/8 in (16 mm) high, but no higher than 2 in (50 mm). Pictograms shall be accompanied by the equivalent verbal description placed directly below the pictogram. The border dimension of the pictogram shall be 6 in (152 mm) minimum in height." There are minimums for how far braille must be raised above the surface of your ADA sign, and at The Sign Studio we have the precision machines to get it just right, keep you compliant, and make your signs readable and accessible. We also are completely updated and able to write in perfect Grade 2 Braille, a capability not all sign companies share. We also are well trained and well versed when it comes to all ADA signage symbolics, and all related braille sign explanations and text. Horizontal separation between cells: .241 in. Vertical separation between cells: .395 in. Raised borders around signs containing raised characters may make them confusing to read unless the border is set far away from the characters. Accessible signage with descriptive materials about public buildings, monuments, and objects of cultural interest may not provide sufficiently detailed and meaningful information. Interpretive guides, audio tape devices, or other methods may be more effective in presenting such information. As you can see, that kind of minute detailing requires incredible precision. That's why The Sign Studio has invested in the best, sharpest sign creation equipment. With laser precision, we can make ADA restroom signs to absolute perfect margins and regulations, and every ADA sign we make for your company can be crafted with amazing exactitude. That's important not only to make your signs compliant, but also to make them readable. For braille users, it's important that braille signs be the same as the braille they read in texts, to cut down on confusion. Confusion that could range from mere frustration to the possibility of danger, neither of which serve you, your place of work, or your guests. The signs in your space are important on a number of levels, but few of them are more important than respect and customer service. Making the best braille sign possible, in compliance with all ADA signage laws and regulations, is a great way of accomplishing both of those goals, and making them with precision and excellence is a point of pride for The Sign Studio. There are several other laws regulation ADA restroom signs. They include regulations related to height, spacing, and sign placement. For instance, all ADA signs intended for use by handicapped persons have to be placed in locations free from any sort of unseen danger, such as the arc of a swinging door, or a protuberance along the wall. A braille sign has to be in a place where the user can feel safe standing still and reading it for any period of time. "Letters and numbers on signs shall have a width-to-height ratio between 3:5 and 1:1 and a stroke-width-to-height ratio between 1:5 and 1:10." This regulation ensures that the characters on a given sign will conform to other characters on other signs, making them familiar and readable. This goes for all kinds of ADA signage, and is one more way these ADA regulations make the world of interior space more palatable and easier to navigate for the handicapped. where B1 = light reflectance value (LRV) of the lighter area and B2 = light reflectance value (LRV) of the darker area. Note that in any application both white and black are never absolute; thus, B1 never equals 100 and B2 is always greater than 0. The greatest readability is usually achieved through the use of light-colored characters or symbols on a dark background. All of these rules and regulations are essential in crafting the most up-to-date, ADA compliant signs possible. For handicapped persons and those who depend on braille, the new regulations are essential to an improved, more familiar quality of life. The new braille signs that will now be produced are alone worth the effort of bringing your signs up to code. Using literary spacing and Grade 2 braille is an important step in leveling the playing field of industrial signage. And when it comes to code-compliant, customer service oriented ADA signage, including of course ADA restroom signs, there's no better place to go than The Sign Studio. Lead the way with Directional Traffic Signs! Prevent confusion by clearly marking Entrances and Exits to parking lots and facilities. Keep your traffic flowing effortlessly with a well marked lot. A direction sign, more fully defined as a direction, position, or indication sign is any road sign used primarily to give information about the location of either the driver or possible destinations, and are considered a subset of the informative signs group. Direction signs are far more varied internationally than other classes of sign. Direction signs are the oldest type of road sign. 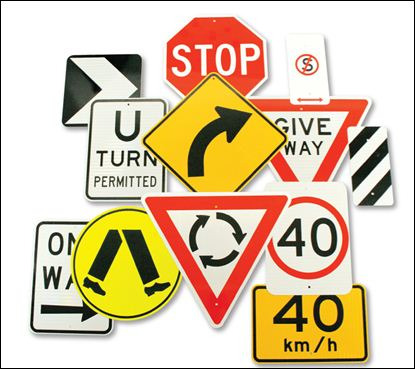 Traffic signs or road signs are signs erected at the side of roads to provide information to road users. With traffic volumes increasing over the last eight decades, many countries have adopted pictorial signs or otherwise simplified and standardized their signs to facilitate international travel where language differences would create barriers, and in general to help enhance traffic safety. Such pictorial signs use symbols (often silhouettes) in place of words and are usually based on international protocols. Such signs were first developed in Europe, and have been adopted by most countries to varying degrees. 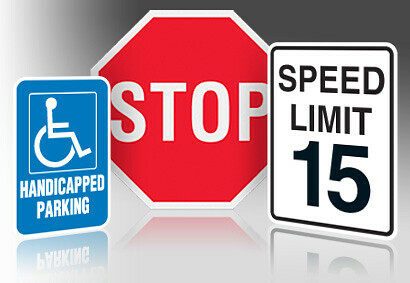 The Sign Studio provides street and traffic signs to help keep your roads safe and traffic flowing at a good pace. Traffic signs are a good way to inform drivers of areas that are entrances or exits only, alert them to upcoming speed bumps or closed roads and many other traffic warnings. Made from durable and reflective material, The Sign Studio's traffic signs are the perfect solution to your traffic control needs. Point people in the right direction with these long lasting and well made signs. • One Way, Entrance and Delivery signs direct people and let them know where to go. • Directional Traffic Signs keep your parking lot, mall or road organized. • Post signs to prevent accidents. Burbank Sign Company | Building, Fire & Exit Evacuation Signs A Must! Building evacuation plans, fire evacuation maps and emergency exit signs are essential to meet fire and building code requirements. 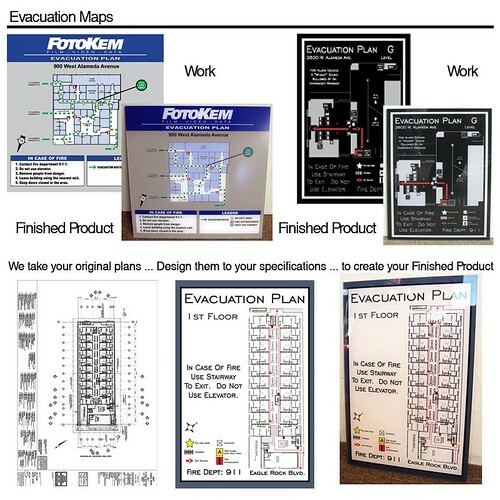 The Sign Studio provides custom building evacuation maps and specialty signs. Building evacuation maps are carefully designed to meet all client and fire code requirements. Our exit signs and exit path marking systems are manufactured custom to your liking. Our building evacuation plans, stairtreads and path marking systems provide clear direction to exits and offer vital egress information and indicate the location of fire and safety equipment available. Public and commercial buildings (with 10 or more employees) are required by law to have an emergency action plan. An emergency action plan (EAP) details the actions employees and building occupants must take in the event of a crisis. The fire plan is a component of the EAP which emphasizes in-house fire safety protocols and procedures. The fire evacuation plan must include a schematic of the facility that details egress routes to fire exits, safety equipment locations, post evacuation assembly areas and other pertinent information. As a public safety measure, the authority having jurisdiction (Fire Marshal) requires that evacuation plans be posted for the building occupant. What Are the Codes and Standards? Much has been written into fire codes and occupational safety regulations about the necessity of posting fire evacuation diagrams. They are required by law in most facilities. Yet visit any number of buildings with posted fire evacuation signs and you will find as many different sign designs as there are buildings. With the absence of a nationally recognized standard to guide facility managers and sign designers with evacuation map development, we have to ask ourselves whether all building evacuation signs are equally effective? Can diagram size, color, floor plan orientation, text or icon styles affect viewer response during an emergency. Our expert designers at The Sign Studio will design and prepare your layouts and work closely with you to create effective and proper Evacuation Maps and Signs for your needs. For more information or if you have any questions, please call us (818) 843-9200 or e-mail us at thesignstudio@sbcglobal.net. Nothing can add more impact to a promotion than an attractive banner and nothing can be less effective than a poorly displayed one. All of THE SIGN STUDIO banners are made with a durable nylon-reinforced vinyl that should last a long time when properly installed. To prevent tearing and ensure long life, follow the guidelines below. If you must use rope to hang your banner, follow these rules. 1. Determine how much rope is needed to tie off the banner. Be sure to give yourself a little extra length. If necessary, it can be trimmed later. 2. Weave the rope through the grommet holes from left to right (see diagram on reverse side). Do this for both the top and bottom of the banner. 3. Tie the top corners straight out and tight from the sides. Be sure the banner is centered and level before tying off the right side. 4. Tie the bottom corners at about a 15 degree angle down from the bottom edge of the banner leaving a slight amount of play in the rope. This will allow the air to escape out of the bottom of the banner. NOTE: If the banner will be hung where it will be exposed to high winds (i.e. between two street poles), wind slits must be cut into the banner to allow air to pass through the banner. THE SIGN STUDIO can cut these wind slits for you when they are making the banner, or you can cut them yourself. A typical wind slit is a "smiley face" half circle, about 2" to 3" in diameter. They should be spaced about 12" to 18" apart. See the diagram on the reverse side for an example. Be sure not to cut slits through your graphics. If the banner is to be installed directly onto a wall, install it by driving screws through the grommet holes and into the wall. 1. Determine where you want the banner to be positioned. 2. Secure the top-left corner of the banner first. 3. Continue securing the banner across the top at each grommet hole, from left to right, making sure the banner is level. 4. Secure the bottom grommets from left to right. CAUTION: When installing a banner directly onto a building, be careful because screws will leave permanent holes in the wall. Some surfaces may also require special fasteners to prevent the screws from pulling out. Before drilling, be sure to obtain landlord or property owner approval. If you have any doubts about installing a banner directly to a wall, refer the installation to a professional installer. Before installing a banner, investigate local sign ordinances, and ask your landlord if any restrictions apply to displaying banners. If necessary, apply for permits at the city code enforcement department. Banners should always be stored rolled up, with the lettering and graphics to the outside. A banner should never be folded, as doing so may cause vinyl graphics to pull away from the banner. If your banner becomes dirty, it can be cleaned with a soap and water mixture. Do not use any cleaning product that contains ammonia. EXPECTATIONS: "It has been said that an outdoor banner is a sail without a ship. Be realistic in your expectations. While a banner is an excellent promotional sign, it is not a substitute for a permanent sign." Real estate signs are an integral component of the Realtors business arsenal. They allow the agent to effectively market a property, and they serve as an important directional aide when conducting an open house. With the advent of technology, real estate signs now function in conjunction with many other marketing tools available to the Realtor. However, they retain their status as one of the most important methods of marketing a home. Unfortunately, real estate signs can become the source of controversy in a community. If residents perceive a preponderance of real estate signs, they will put pressure on local government officials to restrict the display of the signs. Fortunately, state laws exist to protect the rights of real estate practitioners and home owners to market properties via real estate signs. The laws balance these rights with the community’s need to control visual clutter and safety. You must follow the directions contained herein and use common sense. Size - Total Face area no more than 24 (inches) x 24 (inches). Height - Vertical distance from ground to highest point not to exceed 3 ft.
Can only advertise a residence in the City of Burbank. Must be on stake or A-Frame support. Signs must be in good condition and of professional signage material. No balloons or flags can be affixed to the sign, nor any other object that would call attention to it. 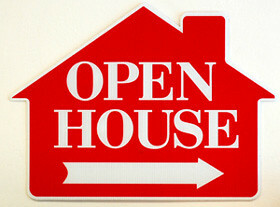 Time - Signs shall only be displayed during the “open house”. Saturdays and Sundays (or federal or state holidays) not earlier than 8am and must be removed no later than dusk or 6pm, whichever is earlier. Thursdays, signs may be displayed no earlier than 8am and removed no later than 2pm. Must have a valid PERMIT as evidenced by valid DECALS on each side of the sign. These permits must be renewed annually. Identification required. Must have your name, address and telephone number affixed to the sign in an area not to exceed 2”x3” (Business card taped to the sign would be ideal). It is recommended that you read the entire ordinance for other provisions not set forth on this sheet. Avoid placing signs on the new Chandler Bike path -- it is considered a median. For a full copy of the sign ordinance please contact the Burbank Association of REALTORS at 818/845-7643. repaired.10. Electrical Wiring Methods, Components and Equipment - Regulations require that "for temporary wiring over 600v, nominal fencing barriers or their effective means shall be provided to prevent access of other than authorized or qualified personnel. Electrical feeds shall originate in a distribution center. Branch circuits shall originate in a panel board or power outlet. Receptacles shall be of the grounded type and flexible cords shall be protected." Burbank Sign Company | Important Information For Sign Buyers! Here's a quick questionnaire to help identify your signage needs and guide your SIGN STUDIO consultant in making good recommendations for your project. Professional? Sophisticated? Youthful? Fun? How should it coordinate with your other graphics and advertising? Where will the sign be displayed? How will it be attached? Will you need the approval of a landlord or local sign code authority? Temporary or permanent? Indoors or outdoors? Sign copy and layout: What message do you want to communicate in your copy? Do you have special logo or layout requirements?